In September the International OTEC symposium will be held as part of the 2013 Asia Pacific Clean Energy Summit and Expo. The symposium will provide a platform for information exchange and discussion, and will identify steps to OTEC commercialization for public and industrial sectors. The symposium is co-hosted by the National Oceanic and Atmospheric Administration (NOAA) and the Korean Institute of Ocean Science and Technology (KIOST). In October the ORC 2013 conference is hosted by Delft University of Technology in the Netherlands, discussing the latest advancements of Organic Rankine Cycle (ORC) technology, which is at the basis of OTEC. New scientific and technical research work on the OTEC power block is within the scope of ORC 2013. Prof. Yasu Ikagami from Saga University (Japan) is part of the scientific committee. This year for the first time the OTEC Africa Conference 2013 will be held. The aim of the conference is to bring together the world’s leading OTEC researchers with organizations that specialize in funding, people from aid organizations, researchers in development/humanitarian issues/sustainability, and governmental institutions. The end goal is to provide African nations with electricity and fresh water, and ultimately bring an exciting clean energy source to many countries throughout the world. The conference is held in Sweden, at the University of Borås. 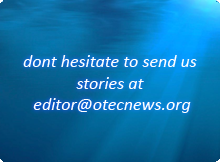 Please visit our conference agenda for an overview of conferences and symposia relevant to the OTEC community.